Dr Stephanie Dowrick offers something much needed for these times: a positive vision of life that lets her speak meaningfully to a wide range of people on many topics including spiritual wellbeing * relationships * social diversity and harmony * conflict resolution * emotional intelligence * workplace relationships and achievement * religious harmony * forgiveness * peace making. 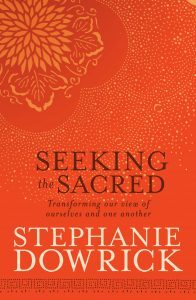 Stephanie Dowrick has been leading spiritually inclusive services at Pitt Street (264) Uniting Church on the 3rd Sunday of each month at 3pm since 2006 and has been giving talks, workshops and leading spiritual retreats for many years. This includes twice-yearly retreats at Mana Retreat Centre, Coromandel, New Zealand, and almost a decade of motivational speaking for Breast Cancer Network Australia. Stephanie Dowrick also works with a wide range of community, educational, medical and religious groups.